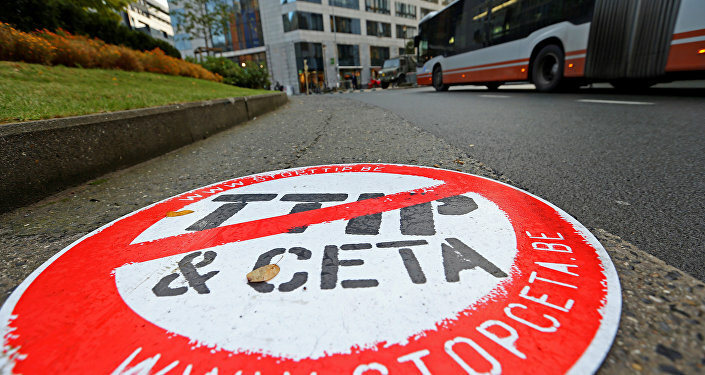 The European Union is waiting for the decision of the French-speaking Belgium’s region of Wallonia on the Comprehensive Economic and Trade Agreement (CETA) with Canada, according to local media. BRUSSELS (Sputnik) – The European Union expects the government of the French-speaking Belgium’s region of Wallonia to make a decision on the Comprehensive Economic and Trade Agreement (CETA) with Canada by late Monday, local media reported on Sunday. If the Wallonia’s government fails to support CETA until late Monday, the European Union will cancel an EU-Canada Summit scheduled for October 27, when the parties planned to sign the treaty, the Contact radio broadcaster reported. EU officials are said to exert pressure on Minister-President of Wallonia Paul Magnette so that he gives a green light to signing CETA. The EU Commission is reportedly holding a meeting with Magnette. On Saturday, Magnette told European Parliament President Martin Schulz that he was not yet ready to make a final decision on the issue, claiming that the agreement still needs time to be thought through. CETA aims to establish a free trade zone between Canada and the European Union, scrapping more than 98 percent of the existing tariffs between Ottawa and Brussels. Opponents fear it would undermine standards and regulations on environmental protection, health, safety and workers' rights.